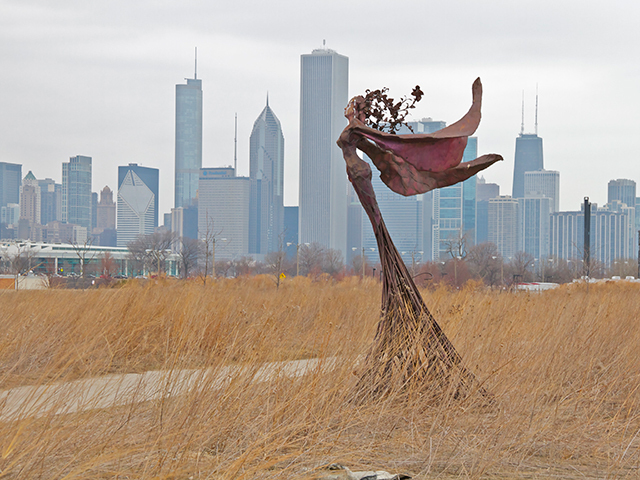 On Northerly Island, there is a beautiful pathway winding through the prairie next to Lake Michigan. You can look a little to the Northwest and see beautiful views of the Chicago Skyline with its ever present skyscrapers far enough away to offer a sense of serenity and calm. It is here that the city decided to keep the 3 statues created by Dessa Kirk called the Daphne Garden as a permanent installation. The renditions of Daphne were crafted from the metal parts from old Cadillacs. Ms. Kirk wanted to restore dignity to the prostitutes she watched growing up in Alaska who were forced to work for money hungry pimps who just wanted the status symbol of a Cadillac. That link about the Cadillac is a great background for the Daphne Garden sculptures, and it led me to do a little more research on Ms. Kirk. This was the interview that I really sunk my teeth into though. It’s a lot more revealing and makes me see her as a little less pristine and delicate and a lot more raw and strong, which is exactly how I see these sculptures. If I had a chance to go back to an earlier time in my life (which I don’t really want to do) I would want to live a life more focused on the arts and more focused on staying down to earth and true to myself. Everyone has to grow up, pay some bills and become somewhat responsible, but very few people stay in touch with their goals that they set for themselves when they were in their youth. Fewer of them ever get back to that and even consider it. Some experience regret later in life for it but some just learn to put it out of their minds. And call people ‘sellouts’ or whatever mean things you’d like, but it’s not easy to stay the course. I recently left a high-rise beautiful condominium that I was renting and moved into a small one bedroom courtyard building in a much cheaper part of town to pursue things that I once said I’d never let go of. In just the past month that I’ve been here and really started sinking my teeth into it, I am astounded at the number of people who indicate that what I want to do can’t be done or just roll their eyes at me. Even more surprising is the people who I thought of as friends who turn around and have nothing to say to me now that I’m more focused on the things that make me ME. I’ve lived that professional, fancy, full-time income job life and I hated it. Every step of the way I hated it. I didn’t even like the stuff I could get for it enough to sustain me through the days I had to do the work. Travel, photography, writing, (and flying in any possible form) were the only things that consistently made me feel alive and like it was worthwhile to be alive. The world does not need another worn out regretful adult. It needs leaders and people who say, ‘Yes, I can…and so can you if you want to…’ and who prove that true. Thanks, Dessa Kirk, for being so rugged and so fascinating that I was inspired to keep writing today. Thank you so very much.